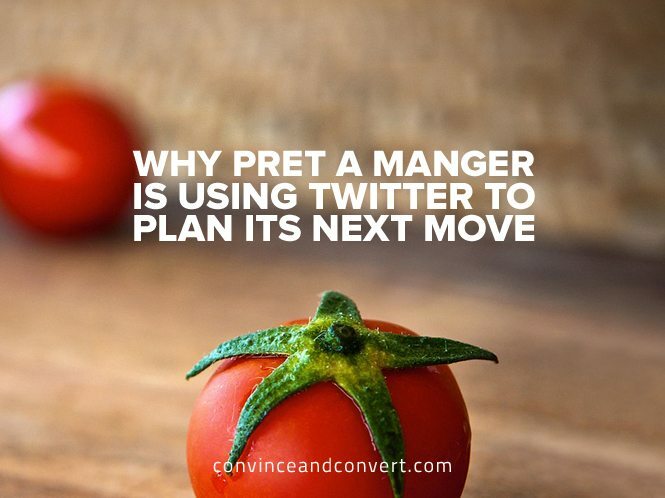 The blog post ends with a call-to-action to tweet CEO Clive Schlee on Twitter with feedback and suggestions on what to do with Veggie Pret. Clive has been active in responding to all consumer questions—including those not related to Veggie Pret. @ladybickley Like everyone else, we aren’t exactly sure. Luckily, Pret is very adaptable and we don’t plan to slow down. As seen on Clive’s twitter handle, he also has quite the sense of humor, adding an important personal element that consumers can relate to. In addition to blog posts and transparency from the Pret A Manger CEO, the company is leveraging its official Twitter handle to let consumers know in real-time how their feedback from the Veggie Pret pop-up shop is driving new menu items. So, what can you learn from this successful pop-up shop? Social media is the perfect forum to share feedback, ideas, and other suggestions around the Veggie Pret pop-up and brand overall. Offering a huge potential for direct feedback, and quickly, was smart of the Pret team and its CEO, allowing customers to speak up as they formulate the next steps around an incredibly successfully pop-up. If consumers are more involved in the next steps and see their requests turn into reality, Pret can increase customer loyalty and satisfaction, while identifying brand advocates. Typically, a brand handle will “own” the ask for feedback, but I applaud Pret’s approach of putting its CEO on the front lines. Naturally, there’s a risk and a reward with this approach. The risk is the CEO becomes flooded with questions and comments, not all related to the task at hand. Plus, once you start this kind of communication, you cannot stop it and must maintain it on an ongoing basis. However, the reward is consumers feel even more engaged with your company. Having a CEO who cares enough to personally respond to consumers is a big deal. It also keeps the CEO and C-Suite more engaged with customers—and more tapped in to the power their customers and social media have in impacting their business. As the Veggie Pret pop-up proves, not all good things need to come to an end. Pop-ups are a great way to test, learn, and translate those learnings into better offerings and customer experiences. Kudos to Pret for including its customers in the process and offering transparency around how their feedback is driving next steps. While this story has not officially come to an end, a suggestion from this writer would be to tap into the power of social media to track and respond to all consumers who took the time to share their feedback, once Pret is ready to spill the beans on next steps. Especially if Pret plans to launch something big, tapping into consumer brand advocates with personal responses will only further drive brand loyalty and set up new ventures, promotions, or menu items up for success.